Spanish Colonial. Santa Domingo. ca. AD 1540's to 1550's. AE 4 maravedes. First Coin of the Caribbean. Countermarked with a anchor for use in Jamaica. Date : Struck during the reign of Carlos and Joanna of Spain, who ruled from 1516 to 1556. 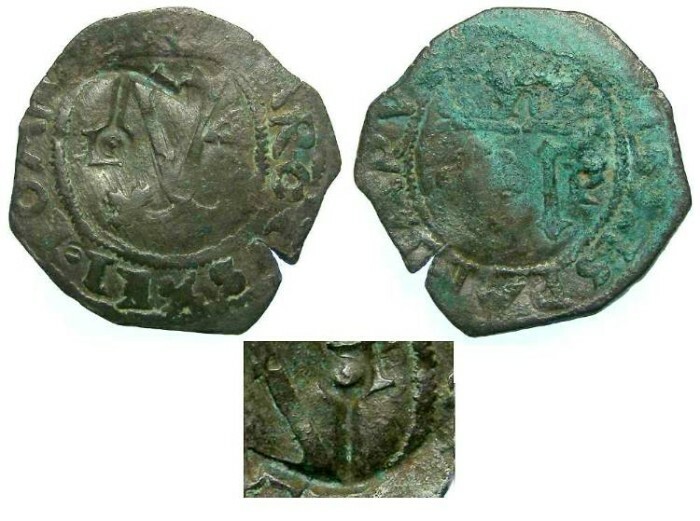 These particular coins were struck between 1542 and 1556. This specimen was countermarked with an anchor to re-value it for use in Jamaica. These countermarks were applied between about 1611 and 1616. Size : 24.6 x 27.2 mm. Weight : 2.95 grams. Grade : The coin grades VF/F with some encrustation and is a crude strike as is usual for this type. The countermark grades VF and is nearly as complete as these get..
Obverse : Gothic Y with CAROLVS ET IOANNA around, but only fragments of the inscription will be visible. The Y is flanked by an F to the left, and 4 to the right. The countermark can be seen on this side, with the anchor's ring right on top of the F and the barbs above that. See the inset image of the countermark where it is oriented up and down. This coin is from a hoard found on the Island of Jamaica in 1973.